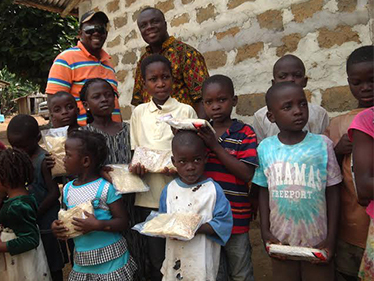 It was a joyful holiday season for many Liberians and Sierra Leoneans as they received 997,920 pre-packaged rice and high-nutrition meals sent by Texas Baptists Disaster Recovery (TBDR) in partnership with multiple ministries. The first container of 142,560 meals, trucked in from South Africa in partnership with Virginia Baptists, came just in time for Christmas and New Year's. Photos bear witness to grateful Liberian children and families holding the food packets at Zion Praise Baptist Church near the capital city Monrovia. When the Ebola epidemic struck the West African countries of Liberia, Sierra Leone, and Guinea early last year and took the lives of many farmers, starvation became an even bigger issue. Since September 2014, TBDR has arranged for multiple shipments of pre-packaged meals, and all have safely arrived. Partnering with Convoy of Hope and ABC Foods, they shipped two 40-foot containers holding 285,120 meals each to Liberia and one to Sierra Leone. Olu Menjay, president of the Liberian Baptist Missionary and Educational Convention (LBMEC) reported that churches have already begun distributing food from the containers. "The crisis is huge, and the needs are huge," he said. "I think this initiative is helping us reach the grass root people in a real way because we're using our churches. This partnership is putting hands and feet to what God has called us to." Aaron Pierce—director of community development and relief for Restore Hope Sierra Leone, a ministry of First Baptist Church in Arlington—reported that distribution of meals began before Christmas. Coordination between Texas Baptists and in-state ministry partners has made the shipments more cost-effective, said Marla Bearden, disaster response specialist for Texas Baptists. Bearden has been making the connections through partners in National Voluntary Organizations Active in Disaster (VOAD). It has also created opportune moments for West African Baptists to share the Gospel, she said, as the food is distributed directly from churches and ministries. "These churches become a mission point in the community," Bearden said. "To me, that's a tremendous benefit. Because we sent the food, West Africans can begin attending these churches and reconnect or come to know Christ anew." Though the Ebola crisis has subsided some, the effects of starvation remain. TBDR currently has plans for seven more shipments of 40-foot containers which, when combined with what has already arrived, will total to almost 3 million meals to Liberia and Sierra Leone. TBDR is also continuing to raise funds and support to send the food. They are hosting a Day of Service on January 19 to pack nutritious rice and soy meals to ship from Texas Baptist Men's Dixon Mission Equipping Center in Dallas. Volunteers can register here for $20 (funds are needed for food and shipping costs). They also encourage those who live outside the Dallas area to plan packing parties of their own. For $3,000 a church, association or community can pack 10,000 meals given by Meals4multitides, an organization of First Baptist Church in Athens that helps churches send food to Africa. To learn more about how to partner with Texas Baptists in shipping food to West Africa, visit texasbaptists.org/disaster.